The Trust was established in 1983 to keep the archives of the Leeds Model Company and R. F. Stedman & Company. Today the Trust provides a service of spares, repairs and technical advice to LMC enthusiasts and continues to promote interest in and appreciation of the products of The Leeds Model Company, founded by Rex Stedman in 1912, and which ceased to trade in 1967. This year, and possibly for the last time, the Trust collection will again be on display with locomotives and stock running at the Tappers Bromley venue. (Bromley Common Methodist Church - Main Hall - Bromley Common Road, BR2 9RZ 10.30 - 5.30). We look forward to meeting as many Leeds enthusiasts as possible and to a thoroughly enjoyable day! Back at base, work has already begun, cleaning, oiling and checking every one of the locomotives, coaches and wagons which will be on display and in operation. Working steadily towards July 13th, the contents of the sixty archive boxes must be serviced at the very least one box every two days! Back home - repatriation after 90 years away! Shipped from England to Australia in 1928, Leeds Model Co , Gresley A1 Pacific loco, is back home to join the archive collection of the Leeds Stedman Trust. As the top link locomotive of the Hordern layout the A1, painted black and named ‘Sydney’, was lost for many years after the layout was sold off by its original owners. Recovered with the layout in 1985 by Bruce Macdonald, the loco was skilfully repainted in LNER livery by the late Bert Edwards, and given the number 4470, that of ‘Great Northern’, the A1 class leader, but nameplates were not fitted. Standing now on the Trust layout the loco has a pair of original LMC brass nameplates, ‘Great Northern’ which came to the Trust with other of Rex Stedman’s large collection of parts of every description. Could these have been the very plates destined for this loco were it to have been sold in either GNR or LNER livery in England. Bruce Macdonald a most careful custodian kept the ‘Sydney’ plates and these accompanied the loco on its journey home. Back in Australia research continues on the subject of the Hordern family, with some interesting recent revelations. The search continues for a suitable museum to house the layout, hopefully where it can be operated. More news on this topic later. The Trust is privileged to be asked to assist with finding good homes for some of the fine locomotives from the collection of Alan Cliff. Alan of course is well known, both for his 'Locks Siding ' articles and his most successful series of books on 'Jack the Station Cat'. Over many years he has been a most enthusiastic collector of UK and European models, both from the major suppliers and individual professional and semi-professional model makers. The locomotives from the Leeds Model Company thus far delivered have enabled several patient enthusiasts on the 'Wants list' to get their desired models. Of particular interest, with no example seen previously, is the pictured LMC North British Atlantic, No. 9878 'Hazeldean'. This loco was never a catalogue item, but a drawing specifically with the loco name and number appeared in the 1935 catalogue (drg 139)and thereafter. The mechanism is a second series standard type with horseshoe magnet, putting the build date at between 1935 and 1950. The loco, which is most likely to be a 'one-off' is in outstandingly good condition, possibly having been repainted. An unusual litem among many unusual items from this eclectic collection. I continue to be delighted at the work put in by Hans van Dissel of the Dutch HRCA to record on their website adverts, editorials and correspondence related to the Leeds Model Company. Starting from 1915, Hans listings are now into the 1950s, and a most interesting story they make. All but a few of the items he displays are held in the Trust archives from the combined collections of Rex Stedman and later his son Adrian, but they are not as readily available to view. To see the Dutch collection please go to http//:www.dutchhrca.nl/lmca.htm. With their kind permission this link will also be added to the archive section of our website. Signals were among the first products of the Leeds Model Company from 1912 onwards. 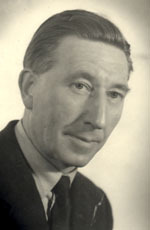 In his introduction in catalogues for 1920 onwards, Rex Stedman emphasised the importance of signalling on a model railway saying ‘The completeness and accuracy to which the line is signalled depends upon the owner’. My good friend and neighbour Peter Sapte who skilfully rebuilt the LMC super detail signal shown here has a fine 4mm scale layout which is very properly signalled. The picture of the LMC 1922 layout shown here earlier this year, like more modern layouts featured in the model press, - and despite Rex Stedman’s protestations - has a signal placed just outside a tunnel mouth - quite impossible for the driver to see! Peter comments ‘ Signals are to tell the driver what he can and cannot do. The main requirement therefore is that a signal must be seen at the earliest opportunity. Placing of signals is thus of the utmost importance. How many layouts featured in published articles have signals placed just beyond bridges/ tunnels and other obstructions? Once a photo is taken and in print the critical eye has plenty of time to judge such mistakes. Back to that 1922 drawing board, and also always see that the signal board is truly horizontal in the stop position! Full marks to Martin Dawes for pulling out from a box of miscellaneous wagons, this rare - if not unique - specimen of an early LMC open wagon. Giving a date to it is very difficult, but from the style and fittings it probably originates from around 1919 -1920, when fittings typical of those on the wagon were in production. One suggestion is that it was used as a promotional item at a time when prior to the introduction of the litho range, hand built wooden rolling stock was the only option available. My good friends in the Dutch Hornby Railway Collectors Association also feature this wagon on the extensive Leeds Model Company section of their website, along with details of several other wagons - no examples of which we have in the archive!. 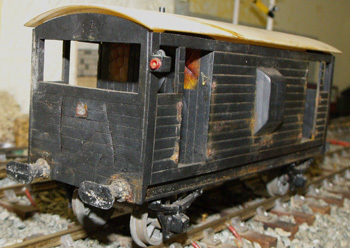 Most recently also details of early modifications to the LMC Bakelite open wagon mould have come to light and are shown further down in the same section of the website. Life is full of surprises, and so are model railways. Having gone into print on so many aspects of the Leeds Model Company productions, I remain on my guard ready to be surprised - and wrong - on any one of them! This time I am indebted to my good friend Alan Cliff for uncovering the latest surprise in the post 1945 all metal long wheelbase brake van. I had been told and always believed without checking that this model was constructed throughout from tinplate. A common repair on the van is re-soldering of the roof tie, and that confirmed time and again that the roof is certainly tinplate. A friend had suggested to Alan that the vans were made from brass. A check with a magnet on the supposed ’brass’ van showed the roof and ends to be tinplate, but the sides were non magnetic. Nor is this a one-off. I have now checked the archive model and it is the same, an exploratory scratch on the inside of the van confirming - brass! The model depicted here also proved to be the same. So, what are we to make of this discovery? The Leeds Model Company were ever driven to economise on materials and, after the brass framed mechanisms of the 1920s were replaced by the zinc die cast designs, brass was very little used. Having thought about it I believe that the answer lies in the forming of the ‘planking’ on the van sides. Producing the grooves by scoring on flat tinplate would remove the protective tin leaving the underlying steel vulnerable to corrosion. This would not be a problem for brass. Producing the grooves by pressing the tinplate - as is done on the short brake van, (A magnet test on this van shows it to be all tinplate), would require a relatively expensive press tool. The length of the long wheel base van’s sides might also be outside the capacity of the LMC’s presses. Either way the solution to use brass, and cut the planking grooves makes sense. In my book on the Leeds Model Company I refer (page 54) to a moulded resin model of the long wheelbase brake van which I have in the archive, and shown here. This replicates exactly the dimensions of the metal van. One suggestion is that it represents an unsuccessful attempt by LMC to economise further by moving from the necessity to use brass and hand building of the metal model to the lower cost resin and less labour intensive assembly of a fully moulded vehicle. The lack of success is evident on the model, the van end and other areas of the resin breaking up during curing. What is the correct explanation of all this? We shall probably never know, but remain on guard for the next revelation! I am indebted to David Beveridge for further information on the long wheel base vans. His model shown here, with the exception of the duckets and axleboxes is wholly of tinplate construction. The ends clearly show they were press formed, and in effect closely resemble those of the short wheelbase van. Visual comparison strongly points to them being from the same tooling! The planking on the long tinplate sides is not so well expressed, suggesting that the end sections were separately pressed. This book can only be obtained directly from the Leeds Stedman Trust. If you wish to obtain a copy please use the Contact page on this website. The book is priced at £19.95 per copy plus £2.55 post and packing. ….a definitive history of the LMC ….a most welcome addition to the library of anyone interested in the history of model railways. ….excellent value too. …well constructed and the illustrations are generally of high quality….there is much here to grab your interest….I ended up reading it cover to cover. Go to top of page. .